The headquarters and largest branch in the South Georgia Regional Library system family tree is located in beautiful Valdosta, Georgia, also known as the Azalea City, boyhood home to the infamous Doc Holiday. The Willis L. Miller Library will be a true 21st Century library serving Valdosta, Lowndes County, and the entire SGRL Network of libraries. This library is located in North Valdosta and features 34,000 square feet of facilities offering general library services, gig speed WiFi internet, computer work stations, a children's area, teen area, 3-D printing maker space, class rooms, computer labs, microfilm facilities, and numerous well appointed meeting rooms of all sizes to serve the community. This new facility, inaugurated July 28, 2018, is the culmination of efforts by the SGRL system Board, Library staff, stakeholders, and the community. It was made possible thanks to the generosity of donors, and the support of the community. 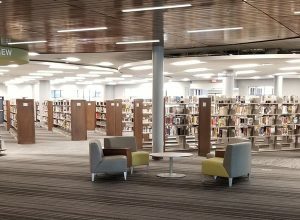 In particular, the SGRL libraries wish to recognize the generous support of Mr. Willis L. ("Wyn") Miller which made this outstanding new library possible. A lifelong resident of Valdosta, Wyn’s love of public libraries came from his mother taking him to the Carnegie Library, Valdosta’s first public library, as a child. A previous trustee and chairman of the South Georgia Regional Library System Board of Trustees, Wyn and his family have a long history of serving in the community. His father, Willis Miller Jr., dedicated land in 1988 upon which the W.L. Miller Memorial Library sits in Lakeland, Georgia. The Miller family is honored to contribute to this facility and to support other libraries in Lowndes and surrounding counties. Mon - Thurs: 9:30 a.m. - 8 p.m. Sat: 11 a.m. - 5:30 p.m. The Willis L. Miller Valdosta is the only SGRL library with meeting rooms available for rental by private businesses, and not just non-profit organizations. The Willis L. Miller Library offers free WiFi internet with very high speed "gig" bandwidth! We also feature a 3-D printer maker space in our computer lab. The only neighborhood library with weekend hours, the Willis L. Miller Library is the perfect place to visit for Sunday afternoon family outings. Fun, Interactive STEM or literature based programs designed for school age children. A book discussion group focusing on cozy mysteries, a subgenre of crime fiction that minimizes adult themes. A story time for young children and their caregivers. School age children participate in build challenges and free build time. Looking for more information on Children’s Programs? Call the Youth Services Department at 229-333-0086! Bring your baby to our weekly Baby Story Time! We meet every Monday at 11:00 am in the Activity room. Not only do we read a few short stories, we also let the little ones do some moving around, work on simple crafts and mingle with other babies (and their parents)! Toddler Time at 11:00am on Tuesdays is the perfect place to bring your 2-5 year old to hear fantastic stories told by our energetic staff! We also have simple crafts or coloring sheets so that the little ones get to take something home to remember the stories by. We’re open and welcoming to all tots, even if they need to move around during the story, so don’t hesitate to come enjoy the fun in our Activity room! Family Story Time is held after school on Tuesdays at 4:00pm in the Amphitheater. This story time is suitable for all ages and perfect for a family that’s looking for something fun to do together in the afternoon. We hope to see you here! Our Brown Bag Book Club gives chapter book readers the opportunity to get together, have book discussions, do art projects, and generally have a blast! We meet every 1st and 3rd Thursday in the Activity room at 4:15pm. Our Teen Book Club meets at the Valdosta-Lowndes County Library on Tuesday at 4:00. We alternate doing book discussions on books members choose, making crafts, and even occasionally watching movies. Basic-Level PC Classes with Eric: Every Thursday from 8:30-9:20. Call the Information Desk at 229-333-0086 for more details. Toastmasters: Join this group every Thursday at 6:00 to improve your public speaking skills. Come to any session to sign up. Spanish Classes with Kiersten Jakes: Learn conversational Spanish while engaging in fun activities. Meets from 6:00-7:30 on every Monday. To sign up, just come to a class. Legal Help from Georgia Legal Services provides one-on-one legal help on a first come, first served basis on every third Friday from 1:00-3:30. Come to the Information Desk (229-333-0086) for more information. English as a Second Language Classes (ESL): Coming soon!